This "how to" book takes the mystery out of the Small Claims Court process. This much-needed civil law guidebook teaches the reader about every major step that's followed in Small Claims Court, from bringing a claim, to defending a suit, to enforcing a judgment. 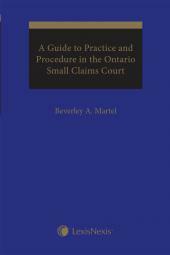 While there have been books dealing with the rules of Small Claims Court, there hasn't been a comprehensive handbook that teaches readers how to litigate a small claims case - from start to finish. Written by an experienced Toronto Small Claims Court judge and college legal educator, this "how to" book takes the mystery out of the Small Claims Court process. This much-needed civil law guidebook teaches the reader about every major step that's followed in Small Claims Court, from bringing a claim, to defending a suit, to enforcing a judgment. Michael O. Mungovan was called to the Ontario Bar in 1965. Later, he received an LL.M. and a Ph.D. from the University of London, England. He practiced law as a corporate lawyer in the law department of a leading oil company, working in the fields of commercial law, labour law and employment law, and then practiced law as a general practitioner. He has worked with companies to develop in-house manuscripts on legal issues for employees. Throughout his legal career he has been involved in legal education, in particular, teaching paralegals and law clerks at Humber College in Toronto. 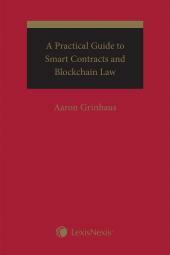 He has published books on Competition Law and Contracts. Currently, he is a deputy judge in the Toronto Small Claims Court, and has occupied that position since 1994. 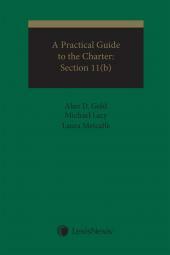 Chapter 1: What Kind of Court is the Small Claims Court and What Does it Actually Do? Chapter 2: May One Bring His Grievance in Any Small Claims Court, or is the Choice of Small Claims Court Restricted in Some Way? Chapter 3: Who Can Sue, and Be Sued, in the Small Claims Court? Chapter 4: How Does One Commence a Lawsuit in the Small Claims Court? Chapter 5: How Does the Defendant Reply to a Plaintiff's Claim?